Born on 1 January 1883 in Woodstock, Ontario - next of kin listed as Mrs. Carrie Beatrice Parkinson, c/o Evening Journal, Ottawa, Ontario - at the time of his enlistment in 1915: trade as newspaper manager; married; currently a member of the 43rd Regiment, Duke of Cornwall's Own Rifles; previously served with the 22nd Regiment; Presbyterian; height of 5 feet 6 inches; chest of 35 inches fully expanded; fair complexion; grey eyes; light brown hair. 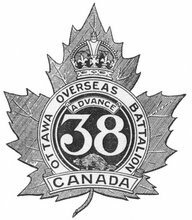 Joined the 38th Battalion, CEF, in Ottawa, Ontario, on 1 February 1915 - served with the 38th Battalion during its period of garrison duty in Bermuda - landed in France with the 38th Battalion on 13 August 1916 - served as battalion adjutant from 4 November 1916 [until?] - sent to England for leave to Canada on 6 December 1917 - rejoined the 38th Battalion on 17 March 1918 - sent to England for duty on 10 June 1918 - seconded to the Canadian War Records Office from 26 September 1918 to 18 July 1919 and promoted to lieutenant-colonel. Awarded the Distinguished Service Order - "New Year award, 1918", therefore, no formal citation - unit recommendation date unknown (award announced 28 December 1917): "For distinguished services rendered." Awarded a Mention-in-Despatches - no formal citation - unit recommendation date unknown (award announced 1 June 1917): "For distinguished and gallant services and devotion to duty." Awarded a second Mention-in-Despatches - no formal citation - unit recommendation date unknown (award announced 28 December 1917): "For valuable services rendered."